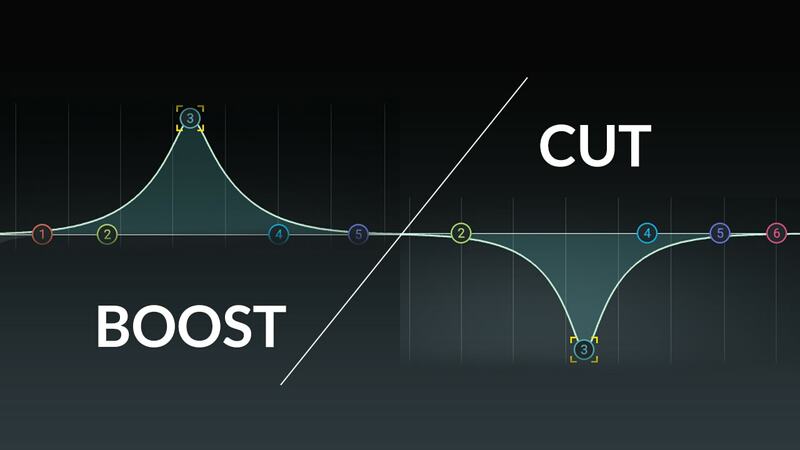 Waves » Learn » Blog » 6 EQ Tips: Boost or Cut the Frequencies? 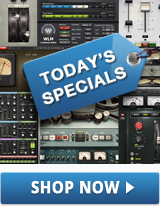 Equalization is a mixing engineer's most powerful tool. It can repair a poor recording, or transform the sound of an instrument. Surprisingly, these sophisticated tools only have two functions: to add more of, or to reduce the amount of a set of frequencies. The act of boosting or adding more of a frequency range is called additive EQ. The act of cutting or attenuating a frequency is known as subtractive EQ. Both methods have their benefits, but it can be difficult to know when to use which approach. The first step is to develop an understanding of how an equalizer works. The frequency control allows you to select which frequency you want to manipulate. The human hearing range runs from 20 Hz to 20 kHz, so most EQs allow you to select frequencies within that range. Parametric EQs also allow you to choose between three basic EQ shapes: bells, shelves, and high-pass / low-pass filters. A bell curve uses the selected frequency as the center point for its boosting or cutting, whereas shelves and HP / LP filters use their selected frequencies as the starting point for their adjustments. Bells allow you to boost or cut, and are designed to focus on a specific frequency. Shelves are used to boost or attenuate everything below (low-shelf) or above a certain point (high-shelf). Filters are used to cut all the way to zero, or remove everything below (a high-pass filter) or above a certain point (a low-pass filter), which means either way, they're inherently subtractive. Gain controls how much of the selected frequency is added or removed. Turning the gain up increases the amount of the frequency to add, and turning the gain down removes more of that frequency. The Q parameter stands for quality, and controls the shape of the EQ curve. High Q values use steeper curves, which affect a smaller range and allow you to pinpoint specific frequencies. Low Q values affect a wider range of frequencies and tend to sound more gentle when used subtly. Q is also applied to shelves and filters, and dictates how steep of a curve their adjustments come into play along the frequency spectrum. Parametric or paragraphic EQs allow you to control all three of these parameters (frequency, gain, Q) independently, while semi-parametric EQs use fixed settings for some of the parameters. For instance, the API 550 and 560, or PuigTec EQs, use fixed frequency controls, which means you can only boost or cut a few predetermined frequencies, as opposed to the Q10 or F6 equalizers, which give you full control over adjustable bands. The curves of how the hardware units handle the selected bands and their surrounding frequencies depends on the specific model – some, like the API EQs feature a “proportional Q” that adapts as more boost or cut is applied, starting with a wide bandwidth at low boost/cut levels and narrowing at higher settings. Why an in-the-box mixer may choose to use a hardware-modeled EQ with limited detailed control over a fully paragraphic option depends on a few rationales: Given the situation, some may like the simplicity of the controls as they make decisions in the mix. Also, many of these hardware units are well-regarded for how ‘musicial’ they sound – a term often used to describe the API and Pultec EQ units (modeled as the PuigTec EQs) – much due to the designs of the EQ curves, and in the Pultec’s case, the slight harmonic warmth added by the vacuum tubes found in the originals. To experiment with the different behaviors of different equalizers, try setting the same settings on different EQ models and see how they sound. Or, take a look at the H-EQ Hybrid Equalizer, which features a blend of the digital and analog-modeled styles, with full transparent control over the blend of digital and hardware EQ curves per band. Now that you’ve got a good grip on how equalizers work, it’s time to put one to use! As you go to listen and manipulate the sounds in your mix, there will come the decision of approaching EQ adjustments by boosting or cutting frequencies to carve out the best possible tones. Some engineers will teach that favoring subtractive EQ will be healthier for a mix, as it won’t allow as much sound energy to build up in non-ideal places. Ultimately, however, there’s no difference between favoring additive or subtractive EQ. For instance, using shelves to boost the low and high end of a track will achieve the same result as cutting the mid-range with a wide bell. The difference between subtractive and additive EQ is in the execution. It’s more about which approach makes the most sense at the time. Essentially, they are different means to achieving the same goal. If a guitar track is masking the vocal, you may be tempted to use subtractive EQ to remove the muddiness. But alternatively, boosting frequencies in the upper mid-range might help add clarity, which will allow you to reduce the overall volume of the guitar and improve intelligibility between the two instruments. Neither option is inherently right, nor inherently wrong — they’re just different ways of getting to the solution. In most cases, the decision to use subtractive vs. additive EQ comes down to one thing: is there too much, or too little of the frequency? For instance, a kick with too much low-end may be described as boomy, while if there’s not enough low-end, it may be described as thin. Alternatively, a pleasant amount of low-mids is described as warmth, while an abundance of low-mids is described as muddy. It’s all about balance. Equalizers are used to balance a signal when there’s too much or too little of a certain frequency. The tough part is usually knowing which frequency is causing the problem. When you’re first starting out, it can be really difficult to identify exactly which frequencies are causing problems. You may be able to tell that a bass sounds too muddy, or a vocal sounds too harsh, but finding the specific frequency that’s causing the problem can be difficult. While nothing replicates good, old-fashioned ear training, the sweeping technique is commonly used to quickly home in on problem frequencies, even for seasoned professional engineers. Start by selecting a band and increasing the Q, creating a narrow peak. Then, give it a significant boost, and slowly sweep through the frequency spectrum. This creates a resonant peak that can help identify which frequencies are sticking out the most. As you slide your way through the frequency spectrum, you’ll start to notice some frequencies ring a little louder than the rest — those are likely the frequencies causing problems in your mix. Once you find the frequency that sticks out the most, reset the gain and Q values, and attenuate the offending frequency to taste. This is an old adage that many engineers still abide by. Using a narrow band with a high Q value is great for sussing out problem frequencies, as well as removing them — but boosting a frequency with a high Q value tends to create an over-focused, unnatural sound. Most engineers agree that using lower-Q values when boosting creates a more gentle, natural sound. Similarly, cutting with a narrow band allows you to remove problem frequencies without “gutting” a track and making it sound hollow. However, keep in mind that the frequency range on a paragraphic equalizer is not linear. There’s roughly the same about of distance between 100 Hz and 200 Hz as there is between 5 kHz and 10 kHz, which means you can use less aggressive Q values with lower frequencies, while high frequencies require more precision and detail. While it may be tempting to solo up a channel to hear it more clearly before EQing – don’t do it! Make sure all of your tracks are working together, and try mixing without soloing. This will allow you to make more informed decisions about what each EQ change is actually doing to the instrument in the context of the mix. It’s okay to occasionally reference tracks in solo to make sure there’s nothing strange going on, but EQing in solo too often will usually cause conflicts between instruments in the mix. At the end of the day, there’s no right or wrong way to set EQ: it’s all about getting the signal to sound right by any means possible. Whether you use subtractive or additive EQ, or a combination of both, what’s important is that you’re serving the song (and always keeping your output levels in check). Are you spending a long time to get your mix settings just right? Avoid mixing fatigue with these 6 important tips. 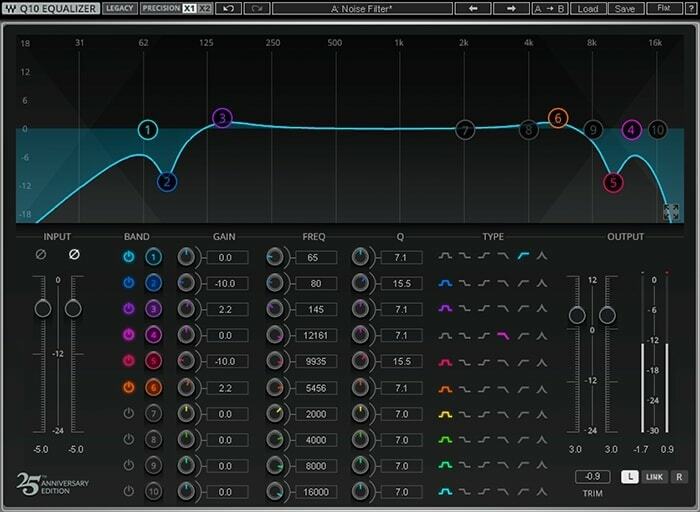 Do you have any boost v. cut EQ tips that we missed? Let us know in the comments below.